Our Guest Artist Edition series has given us the unique ability to work with artists of many backgrounds and styles, many of whom are stars in the comic industry. One of these incredible talents is Edwin Huang, who's helming his own version of Munchkin Guest Artist Edition. I recently had the pleasure of sitting down with Jim Zub, co-creator of Skullkickers with Edwin, to get the inside scoop from an amazingly talented colleague, and Jim was more than happy to help! 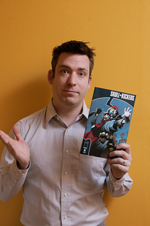 Who is Jim Zub? What have you worked on and why are you so awesome? I'm a comic writer based in Toronto, Ontario, Canada. Over the past 15 years I've written for pretty much every major comic publisher in North America. I love telling stories and making comics! What's it like working with Edwin Huang? Edwin is an absolute dream to work with. He's a pro in every way. He brings so much skill and energy to his artwork, but he's open to feedback and always delivers stunning visuals every time. Working with Edwin has been one of the highlights of my career. What other projects are you working on? Anything with Edwin? Last year Edwin and I finished a 5 year journey on our sword & sorcery-comedy series called SKULLKICKERS. We don't have anything currently in the hopper, but I'm hoping that will change in 2017. If you could make a Munchkin card based on Edwin, what would it be called? The Edwin card would be called "Speak Softly, But Carry A Big Pen." He usually lets me do most of the talking, but his art speaks volumes! I'm launching the new Dungeons & Dragons comic series from IDW in April and Thunderbolts from Marvel in May. To keep up with my latest projects and read tutorials on how comics are written, check out my website, www.jimzub.com. Thanks to Jim for taking the time to talk to us! Keep an eye out for Edwin's Guest Artist Edition later this year!